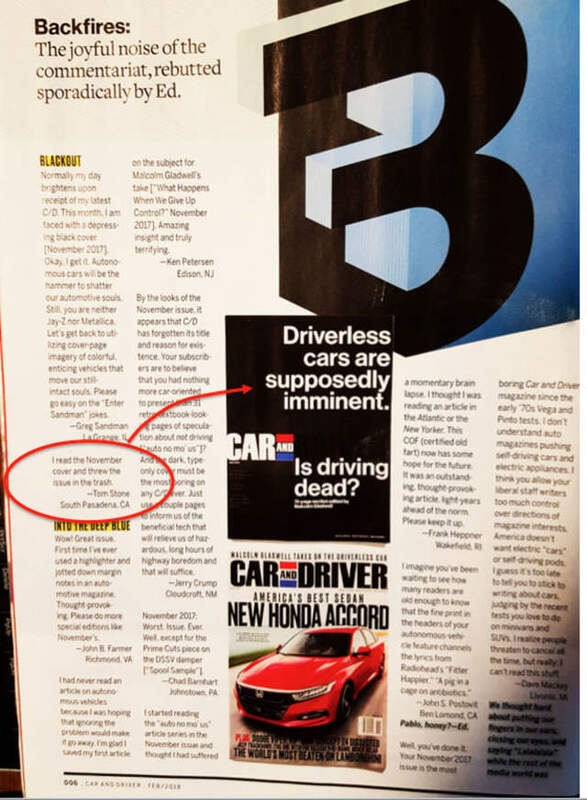 I had a bit of surprise when I read the letters to the editor in the Feb, 2018 issue of Car & Driver. Hey I saw that and wanted to ask if that was you. I was pretty certain when I read it and forgot to ask you. Your comments gave me a good laugh. I grew up in Pasadena and my wife and I when we first married lived in South Pasadena up on the hill above the old Pasadena power plant. I spent a lot of time as a kid visiting Rusnak Porsche when old town Pasadena was a part of town you avoided. Wow, small world. The hill you mention is commonly called Raymond Hill and I run by there 3 or 4 times a week. I live in a 105 yr old Craftsman house in the Marengo area. And yes, I remember it well when Old Town Pasadena was to be avoided before it became a mecca for hipster shoppers! And I'm glad that you got a laugh out of my comment - it was supposed to elicit that response. I was worried that it might sound a bit too harsh but wanted to get C&D's attention and it seems that it worked. Last edited by thstone; 02-24-2018 at 09:08 AM. I got published in Car and Driver too, many years ago. My first letter ever sent. It related to the demographic of what car manufacturers were trying to address to save innocent children left in hot cars after a spate of incidents. The demographic was pertaining to idiots. The government was looking at measures to automatically lower windows or other measures and C/D covered it. You can’t cure stupid acts by adults. I had a letter published in Rainbow magazine back in the day (early 80's maybe? ), it was a magazine dedicated to the TRS-80 color computer. My address was included and I got pen pals from all over the world, pretty neat for a 13-14 year old. Our first house was also a craftsmen built in 1900. Speaking of Raymond Hill, you ever frequent Crown City brewery on Raymond Rd? They were one of the first micro breweries in the area. They were open for years and closed right around the time the whole microbrew thing took off. Speaking of Raymond Hill, you ever frequent Crown City brewery on Raymond Rd? They were one of the first micro breweries in the area. They were open for years and closed right around the time the whole microbrew thing took off. Yes, I used to visit Crown City Brewery often! It was a great place for both food and a good beer! Congrats on getting published! Backfires might be my favorite part of C&D.